Just North of 14th Street between Washington and Pennsylvania Avenue lies a pedestrian-only thoroughfare that will transport you back in time—you may even forget that you’re actually in South Beach. 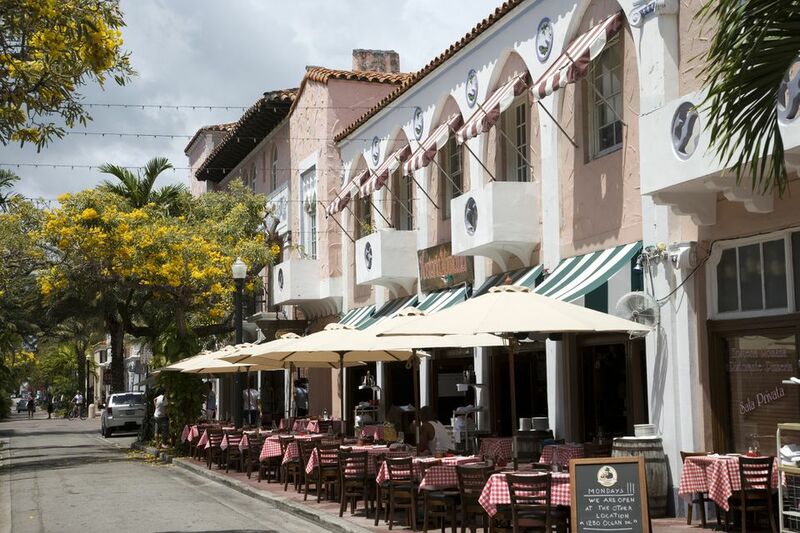 Española Way holds an important place in Miami’s heart and is well worth the visit. In a city that is constantly trying to re-invent itself, Española Way is a part of South Beach that has remained relatively untouched by modern trends and fads. The area is quaint yet quirky in a loving way. From the architecture to the aura, Española Way is a different kind of South Beach. During the Florida land boom in the 1920s, Miami Beach was quickly becoming a scene for the rich and famous. Española Way was the brainchild of real estate developers N.B.T. Roney and William Whitman who envisioned a place with Barcelona’s flair and the luxury of the French Riviera. The area was built in 1925 as a “Historic Spanish Village,” and no detail was left untouched. From the architecture to plaza, the entire space was old-world inspired. It quickly became the hang out for Miami’s beau monde, filled with bars, clubs, and restaurants that would be open all night. But was hard to attract money without crime, and by the late '20s and early '30s, infamous gangsters like Al Capone were using the area for their own purposes. The Clay Hotel, which sits right in the center of Española Way, was a known Capone gambling house. Like much of South Beach, Española Way lost a bit of its charm by the mid-20th century due to crime, gangsters, and neglect. It wasn’t until the '80s when developer Linda Polansky worked to revive the city and specifically Española Way. By the mid-'80s the area had become one of the backdrops on "Miami Vice." Today, the pedestrian-only street is once again a vibrant and fun place to grab a bite, hang out at an outdoor bar, or just stroll around. Lined with restaurants, cafes, bars, galleries, and shops, Española Way is once again the cultural and social center it was intended to be. Española Way is a great place to spend any time of day. The pedestrian-only thoroughfare is lined with quirky shops, upscale galleries, tasty restaurants, cafes, and some really eclectic bars. But besides for the food (more on that below), Española Way hosts lots of fun free events all week long. On Meatless Monday’s you can get all different types of vegetarian options at the street’s restaurants. Tuesdays from 4 p.m. to 9 p.m., an arts and crafts market takes place, hosted by The Market Company. The outdoor market features handmade crafts, clothing, and jewelry from South Florida artist. Hosteria Romana, an authentic Italian eatery on the block, offers free opera performances on Wednesday nights from 8:30 p.m. to 9:30 p.m. and free happy hour from 4 p.m. to 7 p.m. Salsa Thursdays are a popular activity among locals and visitors alike. Head to Havana 1975 around 7 p.m. for the party. Weekends on Española Way are always a celebration, starting with Flamenco Fridays at Tapas y Tintos. Saturday mornings on Española Way are intended for mind and body with a free street yoga class at 9:30 a.m. And of course, the party continues Saturday night with some upbeat Samba dancing in the streets. Meet at Boteco Copacabana around 8:30 p.m. The Sunday market is a fun street fair, and although it’s called the Sunday Market, it’s actually open all weekend from 4 p.m. to 9 p.m.
One thing Española Way has plenty of are tasty restaurants. Head to Hosteria Romana for an authentic Italian brunch—they have great menu from noon to 5 p.m. and offer everything from pizza margherita with their famous homemade sauce to the freshest bruschetta you’ll ever taste. For dessert, grab a cup of specialty coffee and a fresh pastry from Papo Coffee Shop. Dinner is the best meal of the day on Española Way, as you really can’t go wrong. Havana 1957 is a great bar restaurant with an old-Cuban vibe, great drinks, and amazing food. For a more formal dinner try the upscale Mercato Della Pescheria—they offer lunch, but the ambiance and food there at night is truly unbelievable. Most the restaurants on the way are open late, and a lot of them convert into bars and lounges after hours. You can really spend the night just hopping from one to the next. Española Way offers a unique shopping experience. The Española Bar & Lounge is also a cigar shop where you can order custom cigars and light fair and drinks. They even deliver cigar orders. If you’re looking to dress like a Floridian, head to the White Cotton Club whose fashions are clean, timeless, and, of course, white. Since Española Way is only about two blocks in length, there are no public restrooms on the actual thoroughfare, but most of the businesses have restrooms they will let you use. The vibe on the entire street is pretty relaxed, and you can find most things you’ll need. There are also three hotels that open directly onto the street and offer a truly unique yet inviting experience. The historic Clay Hotel and El Paseao are both located in charming Mediterranean revival buildings, and their unique architecture really adds to the experience. Casa Victoria offers the lowest rates on the block, but doesn’t lack in amenities or charm. Española Way is located between 14th and 15th Street in Miami Beach. From Miami International Airport take FL-112 E towards Miami Beach, continue on I-195 E (Julia Tuttle Causeway), and take exit 5 for Alton Road (South). Continue straight on Alton Road, then turn left on 15th Street to Drexel Avenue or Washington Avenue. There is plenty going on near Española Way since you are basically in the heart of South Beach. For some world-class shopping, head toward Lincoln Road or east to the beach. Lummas Park is only a few blocks east, and you’ll know you’ve hit it when you see the ocean.